This is a story of being down & out in a world that has no room left for hope. It is a story of a subjugated humanity plagued by a lack of resources, a lack of trust in itself, and a lack of courage to fight off the oppressors who have bled it dry. It is a story of loss, vengeance, of unforeseeable consequences, of unconquerable resolve and an outdated code of honor, of a hope for the future, and of bitter betrayal. It is the story of a small group of people willing to fight for their right to survive, only to realize that the world and people they’re fighting to protect may not be worth saving after all. 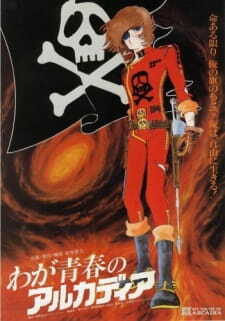 Arcadia of My Youth focuses mostly upon Captain Harlock, already a popular character upon the film’s debut due to the success of the Space Pirate Captain Harlock series from 1978, and his small role in 1979’s Galaxy Express 999 film. This flick, however, does not tell the same tale of the previous television series at all; in fact, it builds upon an entirely new continuity involving an already-present alien-enforced totalitarian control of Earth, and introduces Harlock at a much younger age—perhaps in his early twenties at the film’s start, prior to his losing an eye and gaining captainship of the space battleship Arcadia. As the film progresses, the audience bears witness to his meeting Toshiro Oyama, the creator of the Arcadia, and Emeraldas, the captain of her own vessel and fellow space pirate. Both of these characters had rolls of varying importance in other Matsumoto titles, particularly the aforementioned Space Pirate Captain Harlock, wherein their stories were rather different but ultimately accomplished the same purpose. In the face of the previous titles, Arcadia of My Youth is far more somber and apocalyptic in tone, going great lengths to spell out the desperateness of the cast’s situation. There are times where its melodrama becomes a bit too over-the-top, but for the most part the narrative manages to keep the atmosphere balanced enough to justify itself. The backgrounds and art direction are simply stunning as well, no doubt adding a distinctly bleak ambiance to an already well-constructed setting. The only real detrimental flaws this film has are some rather strange pacing issues. The directing is well-done if largely unremarkable, and the soundtrack—while not nearly on the same impressive level as some of Matsumoto’s other titles—works well enough to stay serious. And I cannot stress enough the inherent beauty present in the art direction & animation quality (especially for its time). However, the narrative itself jumps around rather frequently between periods of action, remorse, exposition, and melodrama, often with less than a short change of scenery to accommodate. Character and plot development suffer only marginally from the rather poorly-structured pacing, but I think it is largely up to the audience’s discretion as to how much this affects entertainment value. Despite its flaws, Arcadia of My Youth still remains one of the quintessential Matsumoto titles, if not one of the quintessential sci-fi anime films ever made. The story is dramatic and engulfing, the characters are strong-willed and determined, the visuals are sweeping and gorgeous, the action is focused and suspenseful, and the tale it weaves has certainly stood the test of time. Highly recommended to anyone interested in anime, especially those interested in older works. I was never a particular fan of the original Captain Harlock series, personally finding it a bit slow and the ongoing plot not being hugely engaging. However, I decided to give the movie a fair shot and it was incredible. Gone are the animation errors and slow pacing, replaced with beautifully smooth and elegant art and animation. The plot is fairly simple, but well-executed and has a few good tear-jerker moments. The movie provides a sort of backstory for Harlock and the Arcadia, also featuring his fellow pirate Emereldas. The villains aren't the series' antagonists but instead the Illumidus, a force occupying Earth - which sets up a good plotline about the lengths to which humans will go for an easy life under occupation. The central conflict, however, is the rivalry between Harlock and an Illumidus leader which leads to a spectacular confrontation in space. The film manages to be incredibly hot-blooded and exciting without the need for loud and fast-paced music, or shouting attack names - the composure of all involved makes the final battle incredibly dramatic. The art is definitely some of the best you'll see, with Leiji's trademark slender and pale characters given fantastic rendering on the big screen and the ships and backgrounds being detailed not in the way, for example, Do You Remember Love relies on incredible amounts of small lights, buttons, rivets and panels, but instead an almost Go Nagai-like use of thick lines and shading. The character design doesn't aim for realism, but instead the traditionally Leiji caricature style where a character's build and expression tells you everything you need to know - heroes are stoic, scarred and wear capes, sidekicks are either square-jawed space heroes or dumpy glasses-wearing friends, and women either wear retro-future catsuits or floaty dresses as they breathily sigh their lines. It's a wonderful piece of retro-future styled sci-fi whose only real flaw is the slightness and predictability of the plot. And the ending song, which evokes the original series' dramatic opening, is stirring in its own way. Arcadia of My Youth is an example of everything I believe a good adventure film should be. Taut yet deliberately paced, easy to understand yet never falling into clunky exposition, and full to the brim with raw, melodramatic emotion, this movie is a perfect introduction to the illustrious Leiji Matsumoto Universe. Speaking from my own experience as someone who was introduced to Matsumoto's works from this film, I can tell you that I cannot wait to learn more about these endearing, over-the-top romantic characters and their strange, anachronistic world. This film is a rare example of an adventure film that is not also paired with action as the focus. While there are a considerable amount of thrilling sequences, the focus here is instead on the plot, which tasks the newly returned from war Phantom F. Harlock II with the fight for his people's dignity against the occupying forces of the Illumidus Empire. While the setting is in the far, far future, it seems to be much more inspired by the creators' experience of world war II and the western genre of live-action film. The antagonistic Illumidus empire seems to parallel the real-life american occupation of japan rather than a more ethereal evil empire typical of space operas such as this. These ties to more earthy, believable milieus serve to very effectively ground the film, allowing it to push the limits of believablility in other ways (a futuristic machine capable of viewing past lives, with the previous incarnations having the same appearance and names as their future counterparts is the most glaring example). forgivable in the context of such a great cinematic experience. Overall, Arcadia of My Youth is a shining example of what japanese animation was and is capable of in terms of storytelling. A wonderful introduction to classic anime for newer fans, I wholeheartedly recommend this movie to virtually everyone who has a taste for adventure and hope in their heart. You will surely be better for viewing it. "Arcadia of my Youth" is an essential piece in the so-called Leijiverse (aka the universe in which Leiji Matsumoto's works exist). True to its title, it explores the youth of one of the main Leijiverse characters, Captain Harlock, as well as his associates (such as Queen Emeraldas). The plot of "Arcadia of my Youth" is very good. Even though it's technically a prequel, it doesn't rely on the other anime of the franchise, but presents a fully fleshed-out story, and manage to tells you what you need about the universe without too much exposition. The story and the events taking place have epic proportions, mixing together large-scale space battles with romanticism. There are quite a few dramatic and emotional moments, which, paired with the action scenes, create a good balance. Also, this movie has a great opening scene, which is one of my favorites. The characters of this anime are mostly stoic, especially Harlock. He doesn't make excessive movements or shout as he attacks; instead, he shows his badass side through his silence. He is the archetype of a romantic hero, who follows his ideals to the point of rejecting society. The supporting characters do not lack characterization either, and they get a steady development. The art and sound are typical of the era. Considering the time this anime was made, they are pretty good. Overall, I believe that "Arcadia of my Youth" is a very good anime, and I highly recommend to everyone, even if you are not familiar with Leiji's works.